By the time you’ve read this halloween lesson plan blog and watched the quick and easy video you’ll have a class prepared and sorted for a kindergarten halloween lesson. 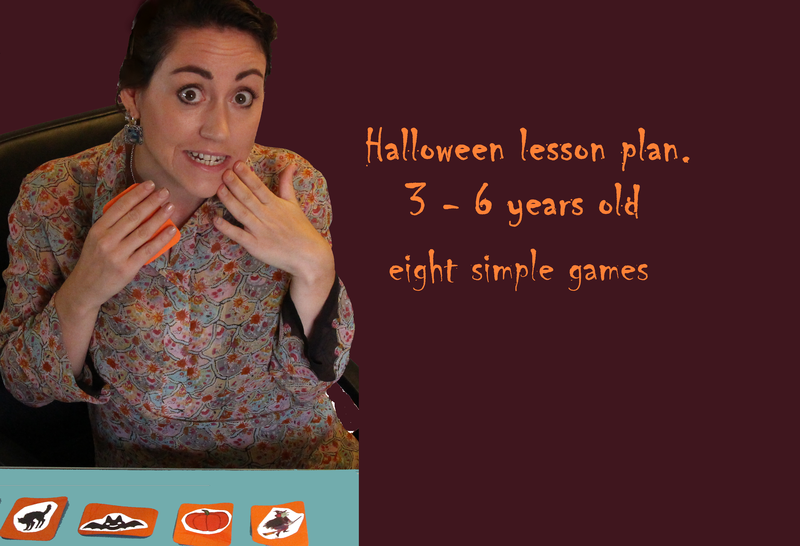 Halloween lesson plan flashcards – free printables can be found here and here. Watch the short video for an easy explanation of this ready made Halloween lesson plan, or read on for more details. Have fun with it, be silly. Show the flashcards – present the vocab, see what they know as you stick them on the board. Flashcard chant – this helps form muscle memory and helps confirm the association of the word to the image. It’s a really good one for shyer children who feel more comfortable speaking in a group. You keep 6 flashcards on the board and rhythmically chant the words in order twice, pointing to each flash card as the group says the word. Now pause and take one flashcard down (it doesn’t matter which). Say ‘uh ooohhh…’ and point to each flashcard (and the space), eliciting the chant from children. Keep taking the flashcards down one at a time chanting until there are no cards left, they can do it from memory and you’re just pointing at spaces on the board! More flashcards – use 6 or more flashcards, a combination of some from ‘Halloween lesson plan step three’ and some new one that you can introduce as you stick them up. Tell kids to open their eyes and put up their hand if they know which one is missing. Put the mystery flashcard back, rinse and repeat. At this stage you can ask the children individually, choose someone who has put up their hand or work down a list – so that everyone has an opportunity. Some shy children may not like this, you can help them out by asking two or three children together – or asking the girls or all the boys to shout out the missing flashcard. Flashcards are a really handy way of introducing and helping consolidating vocabulary, check out Flashcards and fun in the ESL classroom! for more flashcard related ideas. Song with video – I’d recommend knock knock trick or treat by super simple songs it’s a great way to consolidate the vocab you’ve just been going through and introduce the idea of trick or treating too! Charades – have the kids come to the front of the class one by one, you can either whisper a word from one of the previous steps in their ear (making it a listening exercise for that child) or show them the flashcard. The child has to act out the flashcard (which if you did the warm up from ‘Halloween lesson plan step one’ will be easy’. The others either put up their hand to say what they think it is – or shout out as a group. Song and dance – the skeleton dance will get kids up and moving – the video is great because the dancing skeletons are like gym instructors – when they say ‘shake your hands to the left‘ they actually shake their hands to their right – so the kids copy like a mirror and end up shaking to their left – GENIUS! I hope your Halloween lesson plans work out for you, have fun with it, please share on social media! The ideas for some of these games and activities came from Shelley Vernon, check out her page for more! Previo LaLiga football card ESL lesson ideas.